Wildlife officials in Chile released several Andean Condors back into the wild near Los Andes city approximately 80km north of Santiago. The birds received ten days of round-the-clock medical treatment after a poisoning scare in which over a dozen of the large birds mysteriously crashed to the ground earlier this month. The vulture-like birds had been infected by an unknown toxin making them ill and causing diarrhoea and uncharacteristic behaviour. The condor is the world's largest land bird of flight and was treated with reverence by the indigenous peoples of Latin America. However, according to the International Union of the Conservation of Nature, the species is in danger of extinction due to a loss of habitat and lead poisoning ingested when feeding on the remains of animals killed by hunters. The Andean condor is a national symbol of Argentina, Bolivia, Chile, Colombia, Ecuador, Peru and Venezuelan Andes states. It is the national bird of Bolivia, Chile, Colombia, and Ecuador. It plays an important role in the folklore and mythology of the South American Andean regions. 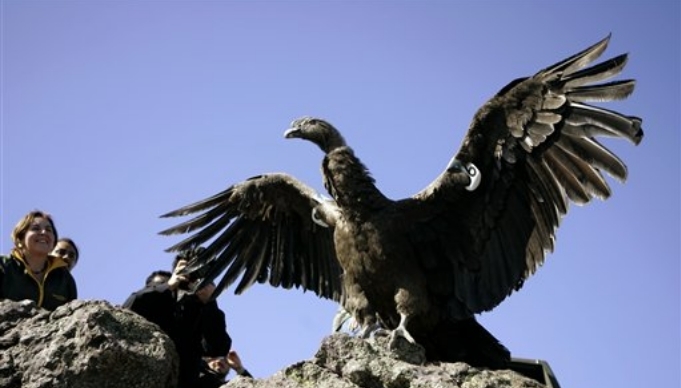 Responses to "Rare Andean Condors Released Into Wild After Poisoning Scare"